These two sided flags are made of sturdy 150 denier polyester and have extra wide headbands with two grommets for easy flying. The flags read correctly from both sides and have liners to prevent light distortion. 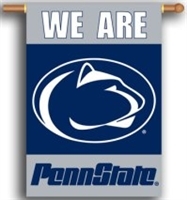 Penn State Nittany Lions 3x5 Single Sided Flags Includes two grommets for flying outdoors or indoor display. These flags have an extra wide headband and are made of sturdy 150 denier polyester. These 28"x40" outdoor banners are designed to hang vertically from an outdoor pole or inside as wall decor. The printed double thickness 150 denier polyester and liner allows the banner to be read correctly from both sides.